The not so secret to great cooking is to use the freshest ingredients available. Is that the case with meat? 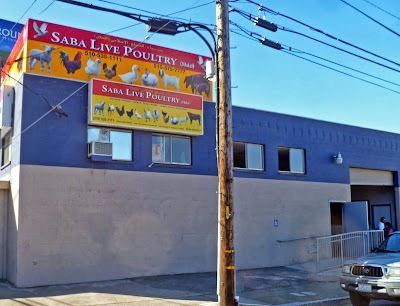 We are taking a Mini Meat Adventure to Saba Live Poultry and picking out a live chicken. They will dispatch and clean the fowl immediately. We will then cook and eat said bird. Let me start out with saying I have no knowledge or experience about slaughtering an animal for consumption. You even might say I am a 'Greenhorn City Slicker". My only experience with dead animals is in the meat aisle of Wally World. This will be an experience. Saba Live Poultry is located in an Industrial area of East Oakland. It is a large warehouse with plenty of parking located in between the tractor trailers making their nearby deliveries. Once inside you are greeted by the smells and sounds of hundreds of caged pidgins, ducks, chickens, roosters, and somewhere were I did not see lambs and goats. The place was clean and recently scrubbed. It did not smell unpleasant but did have a noticeable odor. With that many live animals, barnyard like smells are unavoidable. A friendly, english speaking clerk asked me if I needed help. I told him I wanted a chicken. He knew right away that this was my first time. I did stand out being the only Anglo shopping with predominantly ethnic customers. He warned me not to get to close to the cages because I would get scratched. 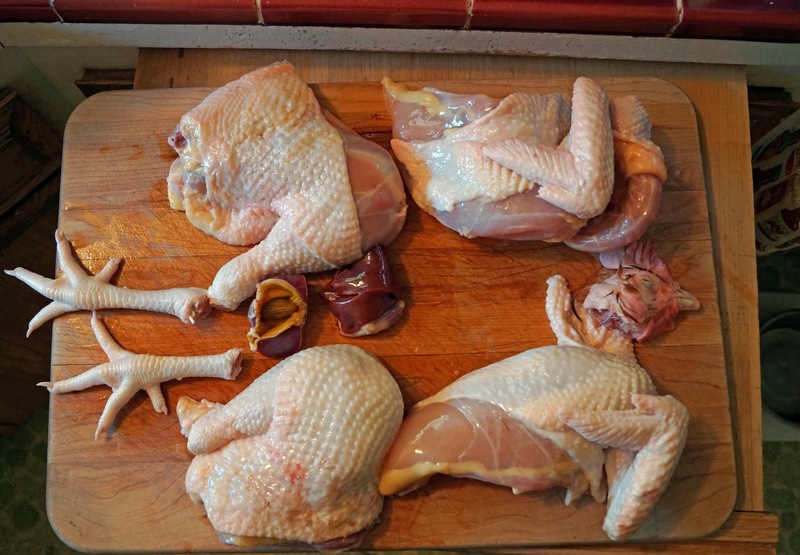 A chicken was picked and the clerk grabbed it by its feet and turned it upside down. It clucked but quickly became docile possibly knowing its fate. The clerk took the chicken behind closed doors for cleaning. I asked him if I could watch and take pictures. He replied the owner would not allow it. Five minutes elapsed and the clerk returned with a black plastic bag. This chicken cost me ten dollars. I returned to my car holding the bag out from my body. I just had a creepy queasy feeling that this cutup chicken might jump out at me or something. I opened the bag to see my chicken. I bravely touched the chicken to feel warm flesh to my fingers. After verification that is was really dead, I took a deep breath and returned home. They included the feet, gizzards and head. The neck was still attached. I reserved the neck and feet for stock in the future. 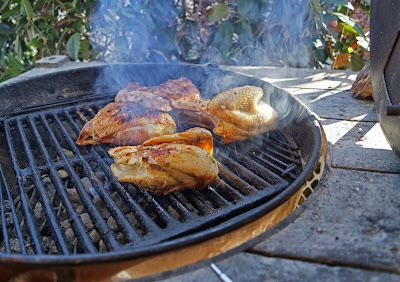 The chicken was seasoned for the barbeque. My initial queasiness has subsided because this was only cutup chicken. The chicken was good looking. It cooked just like any Wally World chicken. The million dollar question is how did it taste? This chicken looked really nice. I cooked it to the proper temperature and let it rest for 10 minutes. Drum roll please. This was one tough old bird. What did I do wrong? It had good chicken flavor but it was tough and chewy. I am a little lost because this is the first time I have cooked such fresh chicken. This was an adventure that will not be repeated. My killing floor with be the meat section of 'Wally Mart". You should have picked a younger bird. Or braised that one. Brings back memories of hanging our at my mom's friend's stand in Puerto Vallarta. She sells fresh chicken. Are y'all going to Eat Real this weekend? Kailyn, I just asked him for a chicken. We will be going to the Eat Real festival tomorrow. See you there. Two reasons the bird has that texture. The heritage breeds that are allowed to range freely will develop sinew and more muscle tone than birds that are confined. If you've ever had poulet de Bresse, you need a sharp steak knife to cut it. Second reason is that a freshly killed bird is still in rigor. The Chinese and other Asian cultures prize that texture as a sign of freshness. A freshly killed bird is usually steamed or carefully poached to not toughen it further and cooked rare, as in red at the bone. Melanie, Thanks for the info. We were not prepared for the texture. I bet we run into you at the Eat Real Festival. Take Care. My great grandmother always hung them and let them bleed for 24 hours before cooking. Said you needed to get that nasty juice out. Never a tough old bird there. 10 minutes from cage to bag, I don't think it was hung. Maybe a nice brine the next time around. Oh, and fry those feet with a nice rub. You'll be surprised. Three Dogs BBQ, This was a Meat Adventure that turned into a learning experience. We probably will stick to Wally-Mart. All I can say is "Wow." I would not have had the nerve to do that - too wussy by far. I'm sorry it was tough, but at least it was tasty. The meat will relax and not be as tough if you leave it in your fridge for a couple of days. That said, birds that move more are tougher, but they have way better lives too. Those are rooster chicken. They are mascular than other chicken. Ironically I like these for this exact reason. It tastes exceptionally well in Bangladesh style curry.